HOT Issues That IGNITE Change! NO, I Am Not a Terrorist! Teri Jendusa Nicolai has survived the unthinkable. Her ex-husband tried to murder her by beating her with a baseball bat, stuffing her bloody body into a garbage can, driving her across state lines and placing her in a storage locker in sub-zero weather. 26 hours later she was miraculously rescued less than an hour from death. Teri came from a loving family, was a college graduate, and on her 2nd marriage. She knew better than to willfully enter into an abusive relationship. How did she end up in this dire situation? 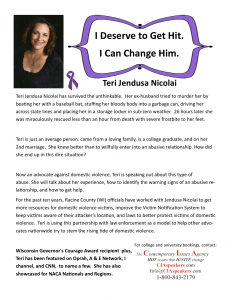 Now an advocate against domestic violence, Teri is speaking out about this type of abuse. She will talk about her experience, how to identify the warning signs of an abusive relationship, and how to get help. 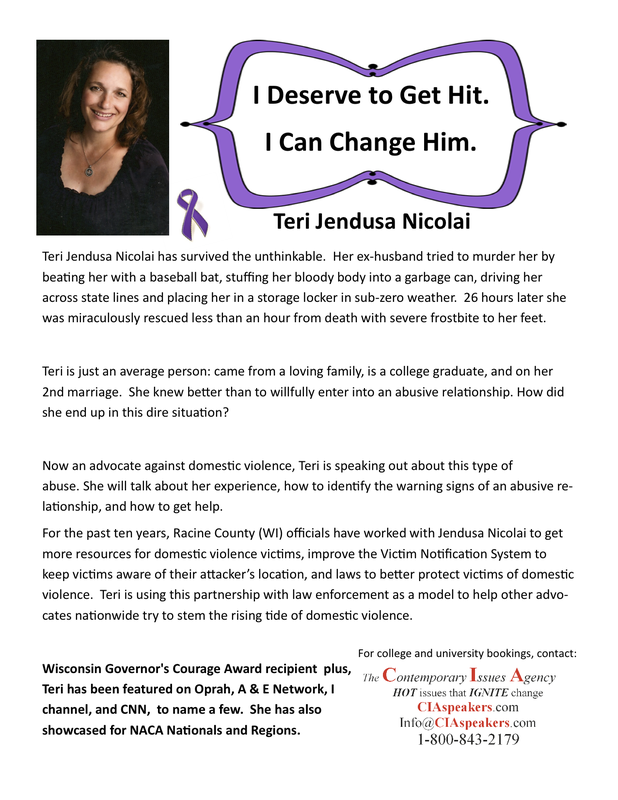 For the past ten years, Racine County (WI) officials have worked with Jendusa Nicolai to get more resources for domestic violence victims, improve the Victim Notification System to keep victims aware of their attacker’s location, and laws to better protect victims of domestic violence. Teri is using this partnership with law enforcement as a model to help other advocates nationwide try to stem the rising tide of domestic violence. Teri has been featured on Oprah, A & E Network, ID channel, and CNN, to name a few. For college and university bookings, contact Contemporary Issues. The program was outstanding. There was a great turnout, about 100 students came to listen to her. Her program was forwarded to the Criminal Justice department at our school so a lot of students heard about it. Teri was a very motivational and inspirational speaker. She addressed the importance of domestic violence awareness and how it could affect anyone. She was personal with the students. She was very nice to work with. We loved how she brought her daughter, they were both very nice people. We loved how she showed us the video describing her situation from the 20/20 special. We enjoyed having her come to campus and will definitely keep her in mind for future programs in the upcoming years! Thank you! I heard wonderful things about your speech at Take Back the Night. Thank you for being such an advocate for this issue. Teri’s lecture went really well last night. She is just so great to work with! Teri made a difference and provided hope. Thank you for your correspondence which was a perfect balance of attentive professionalism without being over-bearing or pushy. © 2015 Contemporary Issues Agency All right reserved.